Poll: What do you guys think of the Snow Troll? So, you're all familiar with mining, right? You can mine diamonds, iron, gold, etc. "Mine" is even in the name of the game, you'd think there would be a bunch of new mining features by now. No, not really, the only mining features added to the game since BETA was Lapis Lazuli, ravines, strongholds, mineshafts, quartz, three new types of stone, and that's it. That's 6 features added since 2011. We should have more mining features, so I'll present to you some mining features I'd like to see in the game. This biome is filled with ice, packed ice, rivers and waterfalls. This biome still has a bunch of stone and ores, but not as much. This biome also has an Igloo Dungeon with 5% chance of spawning each chunk, more on that soon. This biome has 10% more redstone, gold and Lapis Lazuli but 5% less iron, coal, and diamond. This biome can spawn from Y:32 to Y:12 and is usually 3-5 chunks in size. This biome is somewhat uncommon with 25% chance of spawning per chunk. The Igloo Dungeon is shaped like an igloo. This dungeon is protected by a Snow Troll, more on the Ice Troll soon. The loot has 10% of spawning 5 diamonds, 25% of spawning iron horse armour, any iron armour and 3-4 gold ingots, 40% of spawning any leather armour, 3-4 iron ingots and 5-6 packed ice, 60% of spawning bread, 10-15 redstone and 5-7 lapis lazuli, 80% of spawning bread. The igloo has 100% chance of spawning 2 golden apples. Height and Width: 2.7 blocks tall, 1 block wide. This biome is filled with vines, leaves, mossy stone, some podzol and some grass. This biome also has a "Mossy Mineshaft," but it's uncommon with 65% chance of spawning per chunk, more on that soon. This biome has 10% more coal, iron and gold, 5% more redstone, but 5% less diamond. This biome can spawn from Y;20 to Y:0 and is usually 3 chunks in size. 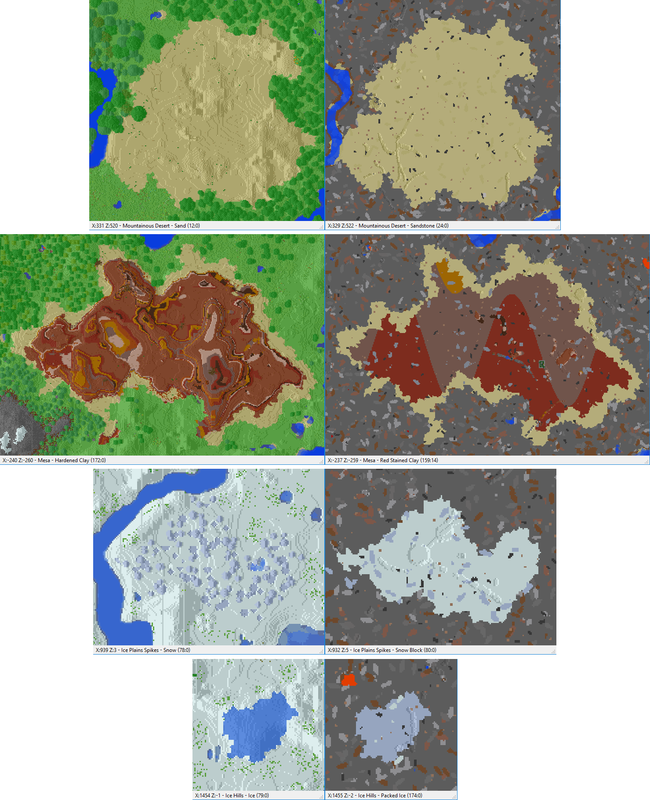 This biome is common with 60% chance of spawning per chunk. The mossy mineshaft is a little bit like your normal abandoned mineshaft, except it has spruce logs, spruce fences, spruce planks, some powered rails and cobwebs. There will be cave spider spawners and witch spawners, as well as zombies and skeletons. The mossy mineshaft only spawns in the bottom 10-15 blocks of the biome. This biome is filled with all types of sandstone, including red, also deadbushes and occasionally some terracotta. This biome is special because it can only spawn under deserts. This biome also has "Desert Dungeons" and has 25% chance of spawning each chunk, more on that soon. This biome has 10% more iron and coal, but 20% less redstone. This biome can spawn from Y:55 to Y:35 and is usually 4-5 chunks in size. This biome is somewhat common with 40% chance of spawning per chunk. This dungeon is made up of sandstone and cobblestone. The dungeon has husk, skeleton and spider spawners. The loot has a 75% chance of spawning bread, glass and sandstone, 50% of spawning 2-3 iron ingots, 25% of spawning music discs and 5-8 lapis lazuli, 10% of spawning 1 diamond and 2% of spawning 5 diamonds. This biome is special, because it has 45% more coal, but 15% less in everything else. This biome may have vines and terracotta. This biome can spawn from Y:30 to Y:10 and is usually 5-6 chunks in size. This biome is somewhat uncommon with 20% chance of spawning per chunk. This biome is special, because there is a lot more lava and it's a lot more dangerous. This biome has 8% more diamond but 15% less coal and gold. This biome is fairly uncommon with 10% chance of spawning per chunk. This biome can spawn from Y:20 to Y:0 and is usually 2-3 chunks in size. This biome also contains a new block: Basanite. Basanite is an igneous rock, much like granite, andesite and diorite. This block looks like stone but much darker and rougher. Basanite can be smelted to make Smooth Basanite, which can be used to craft Basanite Brick, Smooth Basanite Slabs, Smooth Basanite Stairs, Basanite Brick Slabs and Basanite Brick Stairs. Basanite can ONLY spawn in the Lava Pool biome. Basanite can be mined with a wooden pickaxe but not by hand. Rhyolite is an igneous rock, like Basanite. This block looks like quartz but a bit darker and peach coloured. Rhyolite can be smelted into Smooth Rhyolite, which can be used to craft Rhyolite Brick, Smooth Rhyolite Slabs, Smooth Rhyolite Stairs, Rhyolite Brick Slabs and Rhyolite Brick Stairs. Rhyolite appears most in the surface of Extreme Hills biomes, but can appear elsewhere underground. Rhyolite can be mined with a wooden pickaxe. Arkose is a sedimentary rock. Arkose looks like Andesite but more pink-orange coloured. Arkose can be smelted into Smooth Arkose, which can be used to craft Arkose Brick, Smooth Arkose Slabs, Smooth Arkose Stairs, Smooth Arkose Brick Slabs and Smooth Arkose Stairs. Arkose can only appear in oceans or under oceans. Arkose can be mined with a wooden pickaxe. Marble is a metamorphic rock, Marble will replace Diorite. Marble looks like Diorite but a bit smoother. Marble can be polished into Polished Marble, which can be used for Marble Slabs and Marble Stairs. Marble is mostly found in deserts, jungles and extreme hills biomes. Marble can be mined with a wooden pickaxe. Gritstone is a sedimentary rock, Gritstone will replace Andesite. Gritstone looks like Sandstone but a bit darker. Gritstone can be polished into Polished Gritstone, which can be used for Gritstone Slabs and Gritstone Stairs. Gritstone is mostly found on the surface, but it can appear a lot underground too.. Gritstone can be mined with a wooden pickaxe. Granite still remains in the game, but the polished granite is much smoother. Polished Granite can be used for Granite Slabs and Granite Stairs. Granite is mostly found in Extreme Hills biomes. Granite can be mined with a wooden pickaxe. Nowadays, people make strip mines with an inventory full of stone pickaxes, we can decrease this by making it so you can only mine under Y:16 with an iron or diamond pickaxe. These are my ideas to make mining a better experience, I will probably add more to this thread, but suggestions to my suggestion are open. Seems like they are good ideas. I'll comment on each one, but first of all I'll just point out something. These biomes are WAY too big. I' have then 4-5 chunks at most. Also, how rare are they? Oh okay, yeah I'll probably decrease the size of all the biomes. I'll also include how rare they are. Why are there torches in the ice biome? It's not natural, and it would melt the ice. Other than that, it's a very good idea. Correct me if I'm wrong, but I'm pretty sure torches can't melt ice? It seems original enough, but why no cave spiders in the mineshaft? It seems like there's not much of a point. Yeah, good point. Ooh, maybe I could add witch spawners? It's okay and has no issues but the dungeon loot is quite underwhelming. I don't really see anything interesting in this. Ok, it's a risky way to get diamonds. I like that, but it could have some more interesting things like unique blocks. Basalt perhaps? This would just make mining more frustrating and expensive. Really? But like, iron is so common nowadays, I could literally find 40 in 1-2 minecraft days. This made me think. It may sound 'OP' at first, but read on. A diamond biome, with increased rate of diamonds spawning. The biome itself is made out of thick snow, hard to walk through. It contains 'sinkholes' as seen in real life in Russia. They are sometimes visible, but 60% of the time thin snow covers them, making it hard for the player to fall through. Some have ice below, some have water, some have stone, some have snow. They are lethal, of course. Ice is also available in this RARE biome, in lakes. These also have thin and thick versions. There are not many trees around, and everything FREEZES. Yes, freezes. You get frozen ores, which you have to smelt multiple times to get the desired ore. Several blocks such as furnaces can't be used, as it freezes. Neither do redstone contraptions. Bases are nearly impossible to make there for this reason. No villages spawn, no structures spawn. There would also only be like 3 of these biomes in 1 world. About the diamonds: they have an increased spawn rate, but not as high as gold in mesa biomes. So: Only advanced players would venture down to visit this biome, look for it. They wouldn't come here for the diamonds but for the adventure. It's too risky to get diamonds. Sounds interesting, but maybe a bit too challenging. I could add a "Quicksnow Biome" where there is thick snow, frozen blocks, and sinkholes. Also 15% more diamonds. But I think frozen ores are too frustrating. Maybe this biome has a 5% chance of spawning per chunk depending on how big it is. This sounds great, but I have three ideas. 1. In the ice biome, there should also be a chance of dungeons which would be cool. They could have special loot. Saddles and nametags both have a 10% chance of spawning. Gold horse armor has a 20% of spawning. The god apple has an 100% chance of spawning in a small igloo in a chest. This igloo is guarded by a snow troll. The snow troll has the iron golems size and shape while being made of snow like a snow golem. Other loot is guarded by stray spawners because strays are monsters of the cold. There should only be these dungeons in 1 of 1,000 chunks because of how good the loot is. 2. In the sandstone biome, zombie spawners should be replaced by husk spawners because husks are monsters of the desert. This would make Minecraft more challenging too because they give hunger when they hit players. 3. I think that limestone, gabbro, and marble should replace the three ugly sister stones we have today. They can be polished. 1. In the ice biome, there should also be a chance of dungeons which would be cool. Sure. The god apple has an 100% chance of spawning in a small igloo in a chest. You just lost me on "100%" and "God Apple" but maybe 2 normal golden apples would be fine. This igloo is guarded by a snow troll. Okayy, if I were to add this, I would definitely add things like health and damage. Other loot is guarded by stray spawners because strays are monsters of the cold. That's cool. There should only be these dungeons in 1 of 1,000 chunks because of how good the loot is. I'm probably going to change that. The Ice Biome is about 3-5 chunks in size, so 5% each chunk. 2. In the sandstone biome, zombie spawners should be replaced by husk spawners because husks are monsters of the desert. This would make Minecraft more challenging too because they give hunger when they hit players. That's a nice idea. 3. I think that limestone, gabbro, and marble should replace the three ugly sister stones we have today. They can be polished. Well, Basanite is basically the same as Basalt, but I could probably work with this. But I would have to make two of them igneous and one of them metamorphic. marble- white Marble is a great idea. It could be like Diorite but a bit smoother. So I added an Igloo Dungeon, a lot of new rocks and a Snow Troll. If you guys have any additional ideas, that would be helpful. I especially want opinions on the Snow Troll because I've just edited it in my post. Yeah the notch apple idea by me was a bad one. Maybe just increased chance of loot in the chest guarded by the snow troll. I fully support the OP. Honestly, some of these updates should have been made a long time ago. Yeah, thanks for giving me ideas! In this case, the sandstone layer in deserts in much deeper and contains pockets of sand instead of dirt and gravel and sand on the floors of caves; mesa biomes are hardened/stained clay with pockets of normal clay (this generates above sea level as well, but is not normally exposed outside of confined spaces). Ice Plains Spikes is made up of snow with pockets of packed ice, and Ice Hills (a mod biome) is made up of packed ice with pockets of snow (also on the floors of caves, which I've added in a future version). All of these have normal ores embedded in their biome-specific blocks (which are actually placed after ores, which otherwise only generate in stone since allowing ores to generate in blocks like sandstone would present issues with them overwriting structures. It'd also be a good idea to add in variants of ores so they better match the blocks they generate in). While it is more difficult to get stone in these biomes (the deeper layers are normal) they aren't really good for starting out in anyway due to a lack of wood and food, and other biomes are usually nearby. Couldn't the underground "biomes" just be done with large structures that are randomly generated? Torches can melt ice, unless you refer to redstone torches and ice, or to torches and compact ice. Oh, okay. I've already removed the idea of any torches on any ice, since it's pretty unnatural. It seems like a good idea to update minecraft's underground, but I don't think that such specific ideas will really do the trick. We aren't the ones editing minecraft. You make it seem like you're creating a mod that adds all of this stuff. Hey guys, I wrote a Minecraft book called The Griefer Attack! Check it out! I'd really appreciate the support if you read it and enjoyed it! I am in full support of this! I love everything. I want to suggest Basalt, too. Please stop doing group suggestions. One suggestion per thread is enough. The whole point of the suggestions is to be specific and give lots of details. Mojang never looks at the suggestions so it is basically an area to just share ideas. Read the guide for better understanding. Leave any small suggestions in the pinned small suggestions thread.